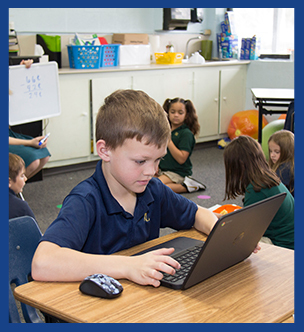 We at Redeemer Lutheran are committed to the academic achievement of our students. Our curriculum addresses the academic, social, and emotional needs of the whole child. Our students graduate well-prepared for success in high school and beyond. Students enrolled in K-4 and K-5 receive numbered grades. 1st - 8th grade receive letter grades. Redeemer Lutheran School offers its students the opportunity to increase their reading interest and skills while earning prizes and recognition through the RLS Accelerated Reading Program. Students select books of interest at their ability levels from a rich variety of books found in their homes, classrooms, and the library. They take comprehension tests on the book they read and earn points toward their reading goals. At the end of each quarter, we publish a list of the students who earned a place on the honor roll. This program recognizes straight-A and A-B honor students in first through eighth grades. We base inclusion on grade averages reported in core subjects, religion, and conduct (excluding art, physical education, music, and handwriting). To ensure that all students meet grade level expectations, Redeemer Lutheran School has several resource teachers. These teachers work in conjunction with the classroom teachers to develop programs that accelerate students in their educational progress. This includes small group instruction as well as in-class enrichment.